You will be given a reference e-book to read which has 213 pages And the test will be based on that e-book , you can take final test within 1 year of purchase. Sports management is such a broad area so taking part in a sports management certification program is one of the wisest moves that you can ever take in your attempt to become an expert in this field. Your best choice is the sports management course offered by Brainmeasures. This online certification from Brainmeasures is developed by renowned experts in the field while sticking to strict ISO standards and regulations so you have a hundred percent assurance that it can provide you with the highest level of information especially about the most commonly used sports management applications and principles. With the help of Brainmeasures, you will receive a highly comprehensive sports management training which will allow you to obtain a clearer view of the exciting and exhilarating sports industry from a business perspective. You will become more familiar about the psychological and sports management principles that work behind them. 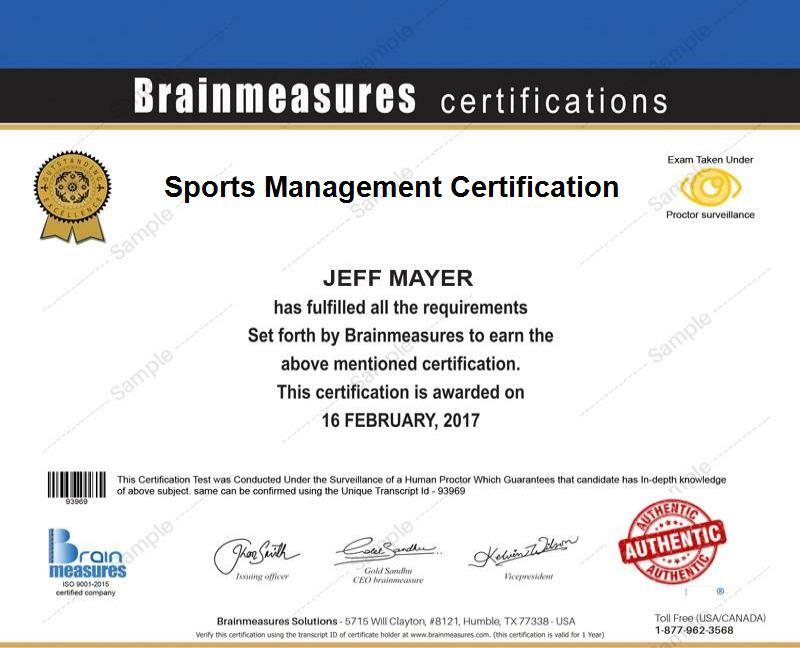 Receiving your sports management certificate from Brainmeasures is also an indication that you have a strong foundation of skills and knowledge in the business field while having the ability to closely examine the interaction of the sports and the business industry. The sports management certification course is definitely a major help in your attempt to become a real expert in the field. The sports management certification program offered by Brainmeasures aims to provide all its participants with a more comprehensive and detailed introduction and information to all the principles and practical applications behind sports management and how different sports organizations operate at state/provincial, national, community and international levels. The sports management certification course is most suitable for venue managers, facility operators, event managers, project managers and new and existing leaders in the sports industry as well as individuals and professionals who wish to qualify in various areas of sports and sports management. If you are planning to complete a sports management certification course, then you have to keep in mind that your experience in this field is not the only factor which can affect the amount of salary that you will receive. Other factors that may affect it are the location where you practice your profession, your position, your employer, the level of your skills and certification received as well as any special skills that you have that will allow you to become an even more effective sports management expert. Note that sports management certification holders are now earning a stable income within the range of $44,000 to $116,000 per year. Most of those that receive the highest level of salary in the field are those that are working in high-paying states like New York, Massachusetts and California.